Why I read this: For most of my life, my dad served as a specially licensed minister and church business administrator. During the summer after my eighth grade year, when my dad was working at a large church in California, my family went to Fiji for two weeks as guests of a large church who asked that my parents—my mom is also a money management extraordinaire—put its finances in order; shortly after we returned home, my parents told my brother and me that we were going to be moving to Fiji to be missionaries. My parents had felt, months earlier, that it was time to leave Sacramento, where I grew up, but it wasn’t until our trip to Fiji that they realized where we were supposed to go. Ten months after our two-week trip, we were again on our way to Fiji, where we lived for three years. I don’t remember reading any books to prepare for going overseas as missionaries, though I do remember reading Re-Entry: Making the Transition from Missions to Life at Home by Peter Jordan of YWAM when we returned to the US. I think my interest in books about missions comes from a desire to better understand our experiences as missionaries. 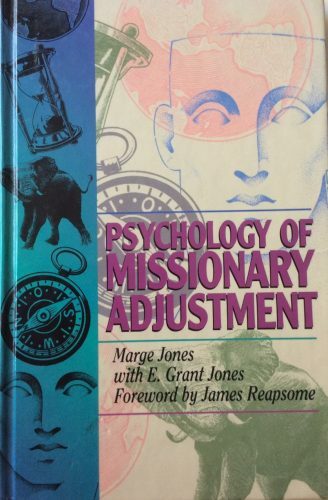 Overview: This book is actually a textbook and Marge Jones, the author, was a missionary along with her husband for, I believe, 60 years, so she has experienced many, if not all, of the things she has written about. The book covers eleven major considerations including missionary selection and orientation; the changes missionaries experience upon arriving on the field; language learning; building relationships with the locals; unmet expectations; privacy; the missionary’s ability or lack thereof to do the work that best suits him or her; areas that may cause a missionary to experience guilt; conflict (the best chapter, in my opinion, and the longest); returning home; and missionary satisfaction. What struck me: I found three references to Paul—the first missionary, along with Barnabas—the most significant information in this book. The first—from chapter 1, “The Pedestal”—relates to the call of Saul and Barnabas in Acts 13: “When God told the church in Antioch to ‘set apart’ Saul and Barnabas, He did not indicate that they should be treated in any special way. They were not set on a pedestal to be admired as unique. They were believers, led by the Holy Spirit, to accomplish God’s purpose for their lives, which is the will of God for all who are followers of Jesus Christ. Unfortunately, an individual today who feels called to missionary service is often set on a pedestal by other believers because of a willingness to give up living in the home country for the sake of the mission field” (18). Even though we were missionaries when I was in high school and many of my friends here in Bangkok are missionaries, I find that I still view missionaries as having a higher calling than non-missionaries and I also essentially expect them to be perfect. I know this is wrong and completely unfair. Missionaries aren’t meant to be thought of as the Christian all-star team; they are fulfilling their calling, as all Christians must do, no matter their calling. The second reference—from chapter 5, “The Letdown”—was surprising: Bible scholars believe Paul’s first missionary journey took place 15 years after his conversion (69). I think I assumed after his encounter with God on the road to Damascus that he was off and running, but he needed time, as do we, to prepare. The last reference—from chapter 9, “Conflicts”—relates to Paul’s conflicts: first, the Jews wanted to kill Paul because he was preaching that Jesus is the Son of God, and then, when he tried to join the disciples, they didn’t believe that he was actually a disciple. Barnabas was able to convince the disciples that Paul had really had an encounter with the Lord and had preached the name of Jesus in Damascus, but sometime later, after a disagreement, Paul and Barnabas parted (Acts 9, 15) (111-112). When I read the Bible, I sometimes fail to zoom out and look at the larger picture. Until I read this book, I didn’t fully realize what a difficult time Paul had at the beginning of his ministry. What I didn’t like: The author and her husband were missionaries with the Assemblies of God, and though the author occasionally mentions other missions organizations and includes information from numerous journal articles, the lens seems to be fairly focused on AG experiences (the book was also published by the AG). Links to further reading: Who knew there were such journals as Evangelical Missions Quarterly and the Journal of Psychology and Theology? There are quite a few articles the author quoted that I’m interested in reading, including “The Trouble with My Home Board Is…”, “Home Schooling in the Missions Context,” and “Why It’s Tough to Get Along with Each Other,” all from EMQ. Those who are preparing to enter the mission field would be wise to prepare by reading more about what they can expect. The name of the book and the contents sounds interesting as i go through your review. Above all your review is clear and catchy.. Thanks Susan Zingkhai for valuable information.. its a blessing continue to spread the love of God through your gift of writing. Thanks so much, Lika, and thanks for reading this post! Thanks so much, Aunt Kathleen! Worchihan encouraged me to start a blog because he thinks I can write well and I wanted to create instead of always only reading what other people write. You can subscribe to our blog by looking at the right hand side — just put in your email address and you’ll get an email everytime there’s a new post. We are trying to post once a week.